I recorded an episode of Iron Game Chalk Talk with Coach Ron McKeefery if anyone would care to listen. Lots of thoughts about the state of our industry. This is a great article from the Mercola site about the potential dangers of endurance training. This is a great presentation by my friend Greg Rose on Long Term Athletic Development. The presentation is based on golf but this could be baseball, hockey or any other sport. Listen to this and you will realize that most “experts” are wrong and aren’t really experts at all, just entrepreneurs who want your money. 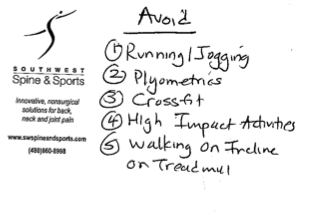 This was an actual Dr’s note sent to me by a trainer. It’s nice to see that Dr’s are getting specific about things to avoid when injured. I would put these two episodes into the “must listen” category. I actually listened to both of Al’s episodes twice.